An in-depth exploration of the process and creative expressions taken by some of the most innovative and outrageous modern urban artists and thinkers. From the guts of an indigenous undaground Feminist emcee who teaches & beseeches us concerning the rampant trampling of Sacred Ground in our cities, the epidemic drug war and programmed poverty as well as the systematic exploitation of the 3rd World To the committed multi award-winning "3 Time Teacher-of-the-Year" Educator who literally wrote the book on how to use Hip-Hop Poetry as an educational tool & bridge to teaching the curriculum friendly formal English Poetry Classics. 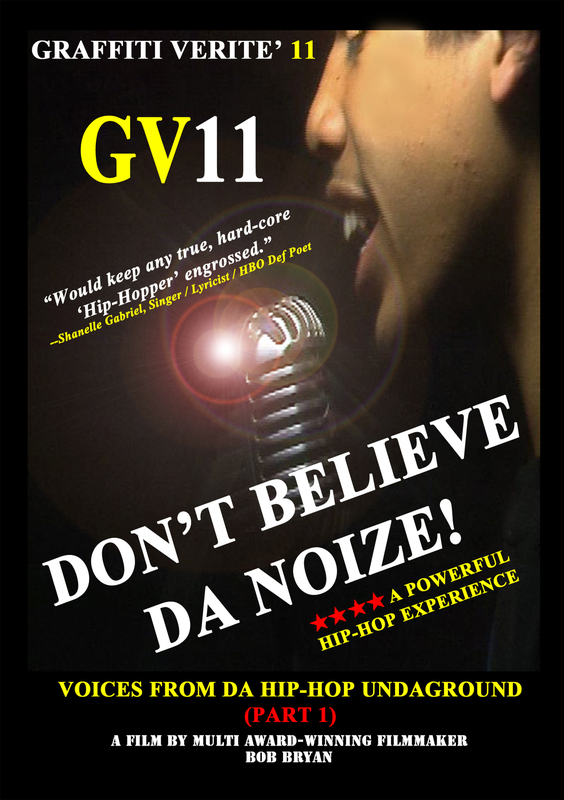 Yet believe it or not, this is just the beginning of the GV11 journey..... GV11 DON'T BELIEVE DA NOIZE the documentary attempts to represent the true heartbeat & complex reality of contemporary American Hip-Hop thought focusing on innovation, movement, brilliance and the raw & unfiltered personalized "truth." Don't you dare be seduced to think that "Real Hip-Hop" can be found on commercial TV or on the Radio...Don't Believe da Noize!!! Take the time 2 explore what's right in front of you. Put some work in and change your life! Starring: Neila, Adisa, Banjoko, Justin Bua, Kutmasta Kurt, Kahlee, Glenn Towery, Mike Perry, Bboy Milky, Mac G, Michael Deet, Jroz, Eddie Nunez, Lo'Key Tha Y.G., Berne, DJ Ethos, Affion Crockett, P.DotC.Period, John o Priest, Gecko Brothas, Misfit, Joshua Silverstein, Earl Ofari Hutchinson, Khalil, Shawnee Gibbs, Shawnelle Gibbs, VYZ, A.N.T.I., Kiawitl Xochitl, Pretty Chi, Johnnie Chavarira, and Jacob "Kujo" Lyons.